SBI Review: How SBI helped me build a successful, high-traffic website, despite the fact that I was originally unfamiliar with the inner workings of the internet. Solo Build It!, also known as SBI! or Site Build It!, is a turn-key website-building and hosting system. They provide EVERYTHING you need to know and utilize in order to create an internet-based business from start to finish, whether or not you are a solopreneur or other legal entity. The cost is $300/year, a cost that has not changed in the 10 years I have been associated with them. Those who understand the art of website construction will quickly realize that this is a bargain representing a value of approximately $4,000 per year. My first foray into writing a website did not start out smoothly. I discovered a web-writing resource by American Writers and Artists Inc. called "Money-Making Websites." It was very good information. I became aware of the possibilities, but the guidelines were incomplete. In a few hundred pages, it is impossible to address everything about website creation. Sure, I could easily type words into a web page template, but about all the other important online parameters I was pretty much on my own. And I knew that trying to press forward on my own would amount to failure. This is because writing for the web requires a whole new skillset and understanding of how the search engines function. It requires attention to a plethora of on-page and off-page signals to help the internet bots identify what the content of the web page is about, and whether people are finding the page useful. If your website pages don't send the correct signals, you may as well not even proceed, because your site will be buried deep amongst the other 200,000,000 other websites clamoring for rankings. I was not interested in writing my heart out to an audience of zero, but that is how life would go if I couldn’t get all the details correct for the search engines. It was during this initial learning season that I chanced upon SBI!. Oh, it sounded great, all right. I watched and read all the testimonials. It sounded awesome. They told me they would help me find the absolutely perfect domain name for my website. They also told me that 85+% of website owners that followed their specific Action Guide eventually achieved enough organic traffic to rank in the top 1% - 3% of all websites. But, it sounded TOO good to be true. “Oh, c’mon!” I thought. “Get real. All that couldn't possibly be true!" So, I simply filed away the information about SBI!, and then proceeded with a website hosted by Register.com. I'll just say it: I wasted 2 months of my life. I began filling out the templates, but detail after detail came to light for which I had no idea how to proceed. I had to subscribe to an expensive keyword service or fly blind. I had no idea what it meant to "ping" a search engine. A couple months later, I learned that the writer of that AWAI course, Money-Making Websites, used SBI! as his website host. That grabbed my attention. I cut my losses, and purchased a subscription to SBI!. That was in 2009. I have not looked back since. SBI does everything for me except create the content, just about. It pings the search engines for me. It provides a powerful keyword tool that brainstorms keywords (so no need for additional subscriptions). It runs every new page through an analysis before I build it, which identifies all those on-and off-page details that the search engines need to properly understand your page. It provides an Action Guide that when followed, will help you create every aspect of your web presence, now including social media. If you follow the guide, you will find the absolutely perfect domain name for your site. And if you stick with it and keep building, eventually you may find your traffic is in the top 1% or 2% of all websites. It hosts forums on every stage of website building so fellow entrepreneurs can help each other with problem-solving and encouragement. The savvy leaders at SBI! keep their fingers on Google's pulse. So when search algorithms convulse, as has happened several times in the last several years, "SBI!-ers" get the low-down and know how to respond right away. Everything about SBI that I thought was nothing but hyperbole was ABSOLUTELY TRUE. My domain name is Raising-Rabbits – absolutely perfect for my website, isn't it?! I’m embarrassed to tell you the domain name I had chosen for the register.com website I discarded. My current Alexa ranking as of today (March 2018) is 299,460. (The lower the number the better: when I first wrote this review in September 2017, the Alexa rank for Raising-Rabbits was 360,467, already well within the top 0.5% of all websites for traffic.) My website is included in SBI! 's Results page: http://results.sitesell.com/. 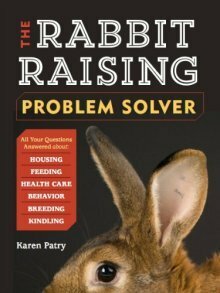 Find Raising-Rabbits in the Hobbies section. During peak traffic season last April (2017), my website received over 7,000 visits per day, by over 4,500 unique visitors per day, who perused over 11,000 pages every single day on average. During August 2017, which is the last complete month and not within the peak traffic season, the website still received over 5,300 visits per day by over 3,300 unique visitors per day, who checked out over 9,100 web pages every day on average. 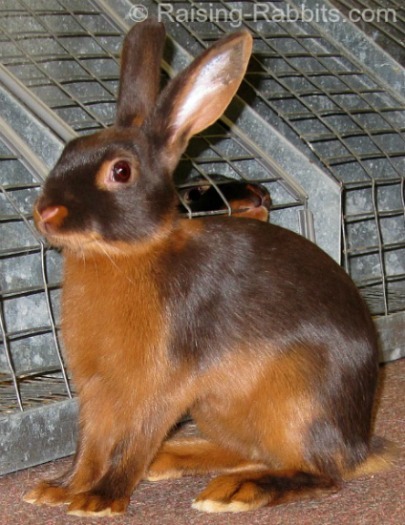 Many of those visitors have found so much value in the absolutely free information about rabbits on my website that they realize the other resources and products on my website available for purchase will be more than worth the investment into the care of their rabbits and other pets. Raising-Rabbits escaped Google's "Panda" algorithm change unscathed, but "Penguin" hit hard. It hit a lot of us hard. (Just keeping this SBI review real.) But the SBI! leaders dropped everything, performed a major study of Penguin's intent, and we soon learned how to make the changes that would put a website back into the good graces of the search engines. As a result, my website traffic now far exceeds the traffic it enjoyed pre-Penguin. There is not a chance I could have achieved these results using any other website building or hosting system currently available. Newbies don't know what they don't know. But with a system as solid and as comprehensive as SBI!, even newbies can follow directions and succeed. 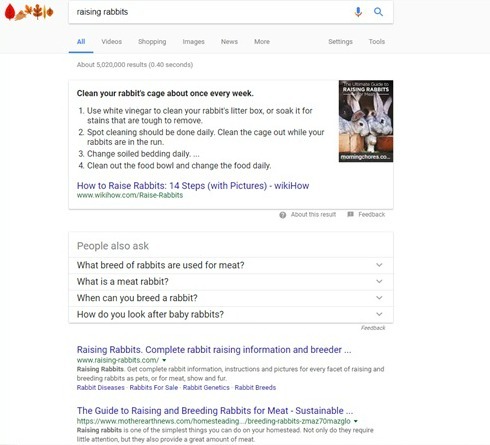 Just for the record, I went incognito and googled “raising rabbits” (without the quotes). Here is a screen shot of Google’s first page of search engine results: Raising-Rabbits is #1 on page 1. For the fun of it, on the right is a screen shot from the Bing search engine. 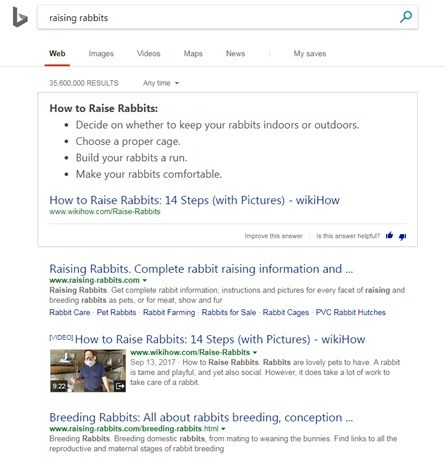 On Bing, Raising-Rabbits secured the #1 AND the #3 spot. If you’ve been looking for SBI reviews, you may have come across various SBI reviews provided by associates of a web-hosting service called Wealthy Affiliate (WA). It seems that no matter what the WA reviewer says about SBI!, whether good or not so good, their reviews always end up the same - WA is the best way to build a website (but no proof cited). Follow the Money: If the SBI review ends up telling you that WA is better or much better, just know that the reviewer has been handsomely paid to write that review and to steer the conversation to WA. This conflict of interest immediately casts doubt on the validity of the review. For the record, no one has paid me a DIME to write this SBI review - I did it because it is the truth, and because I am truly passionate about SBI! and about building my two websites (the other one is www.beautifulpacificnorthwest.com). Is the Wealthy Affiliate program as glowingly awesome as many of its reviewers say? Or am I right in my SBI review, saying there is no other system currently available that will help you build a SUCCESSFUL online business that achieves sufficient traffic to create an adequate (or more than adequate) income? I am not the only one who has wondered this. Dr. Ken Evoy, founder of SBI!, also wanted to know. He’s the kind of guy who is more than willing to give credit where credit is due, so he conducted an objective, rigorous, statistically significant and reproducible scientific study comparing the results of SBI! vs. WA. I won’t go into it all here, because I will simply give you the links to all the details. I will, however, summarize some of the findings in the form of a brief quote from Part I of the study. "SBI! places 2,200% (Alexa), 3,340% (SimilarWeb) and 4,280% (SEMrush) more sites into the Top 1,000,000 sites than Wealthy Affiliate…. "If you’re not a numbers person, that means 22 times, 33 times and 43 times better. And that comes to an average (Alexa, SW and SEMrush) of 33 times better. 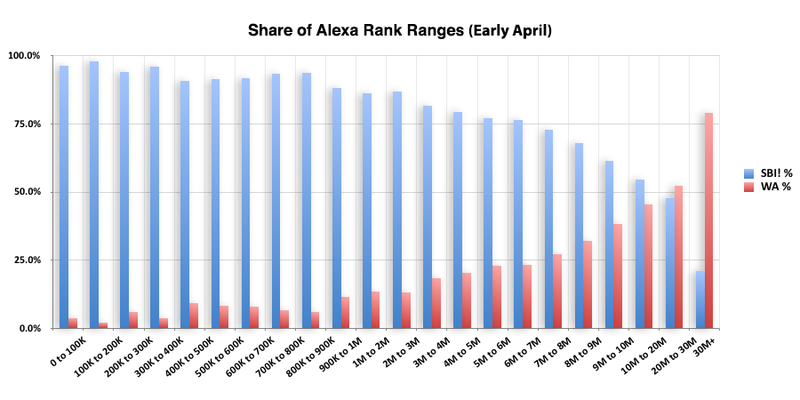 "In the bar chart below, you see bar couples for each range of Alexa traffic rankings. SBI! is blue. Wealthy Affiliate is red, and each couple adds up to 100%. In other words, you see how much of each traffic ranking range (e.g., 0-100K) is “owned” by SBI! and WA." "IMPORTANT: This chart shows absolute numbers, uncorrected for the fact that Wealthy Affiliate has 70% more sites. So the above results are 70% stronger than they look." Wealthy Affiliate "wins" the worst two brackets. It is very clear from the scientific results that many SBI!-built online businesses are doing very well for themselves. My personal experience has borne out the truth of what I see in this graph, and I would HATE to be a "winner" of the ‘invisible’ category! I invite you to check out the full study results, which, besides spelling out the honest truth about which system is most effective, will also reveal the shadowy bait-and-switch tactics of the WA program. Read all three parts for yourself and see what YOU think. Want to Know More Beyond this SBI Review? Check out case studies of other solopreneurs with Solo Build It! Take a 30-minute video tour of Solo Build It! Real Life Success Lessons from Solopreneurs with SBI! Thank you for reading this SBI Review. If you want to know more, feel free to drop me a note via the Contact Us form.